The adopted Irishman will aim to bounce back from his defeat to Demian Maia in December. 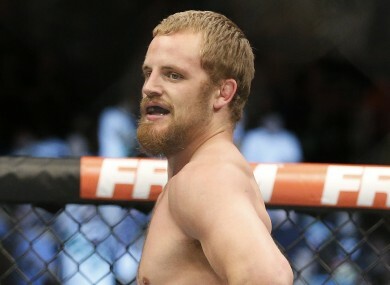 IT’S BEEN CONFIRMED this morning that Gunnar Nelson will return to UFC action in just over two months’ time. The 27-year-old welterweight will face rising Russian star Albert Tumenov when the UFC makes its inaugural visit to Holland. UFC Fight Night 87, which will be headlined by heavyweight contenders Alistair Overeem and Andrei Arlovski, is set to take place in Rotterdam on 8 May. Nelson hails from Iceland but has been a long-time student of John Kavanagh’s at Straight Blast Gym in Dublin, which has resulted in him being adopted by Irish fans as one of their own. Nelson, who has a 5-2 record under the UFC’s banner, recently dropped out of the welterweight (top 15) rankings on the back of his unanimous-decision defeat to Demian Maia at UFC 194 in December. Following five consecutive victories, the most recent of which came at the expense of Lorenz Larkin via split decision at UFC 195 in January, Tumenov is currently ranked 15th at 170lbs. The bout has the potential to be a very intriguing content as Nelson looks to pit his elite grappling against the impressive stand-up game of Tumenov, who recently boasted of being the best striker in the UFC. Email “SBG's Gunnar Nelson booked for a cracking UFC match-up in May”. Feedback on “SBG's Gunnar Nelson booked for a cracking UFC match-up in May”.